SPRING THYME LEMONADE is a gorgeous, refreshing lemonade infused with thyme makes it a perfect beverage for spring!! Spring Thyme Lemonade came to me when I was thinking of combining lemon with a herb, it turned out to be a play on words!! Over at Noshing With The Nolands, I have done this with a Blueberry Basil Lemonade and it was very successful. I have made that a couple of times now, adding in a little vodka if the mood strikes me!! 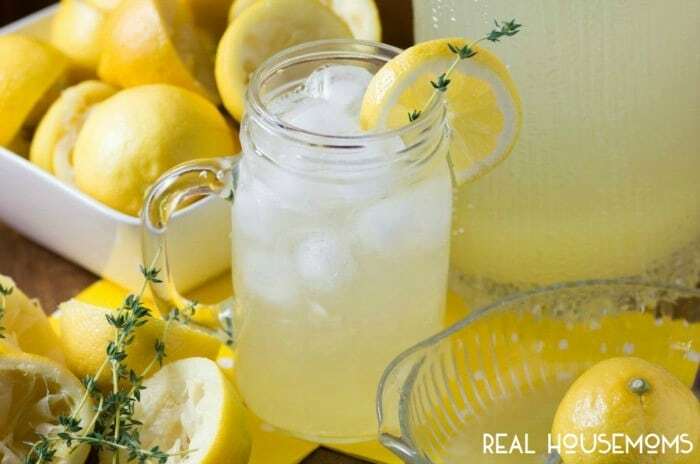 Homemade lemonade is very refreshing, you can control the amount of sugar, the difference between store bought or a lemonade that you get in a restaurant is vast in my opinion. Some of them can be so sweet that they aren’t thirst quenching at all, plus the difference in fresh squeezed lemon juice is amazing. I infused a simple syrup with fresh thyme, not too much but enough to enjoy the flavors together. A little trick to emphasize the thyme but not making it too strong in your lemonade is to garnish with a sprig of thyme. When you take a sip you inhale the lovely aroma of the thyme, adding to the experience. Lemon is such a wonderful fruit to liven up your senses again after the long winter months. We have gotten so used to stews, casseroles, and soups that we need our taste buds to come alive again. This is the perfect time of year to start to think of going outside and enjoying a lovely cold beverage. The BBQ will soon be in full swing again and brunches and lunches are more popular in the spring with Easter and Mother’s Day. This beverage would be perfect for young and old to celebrate. 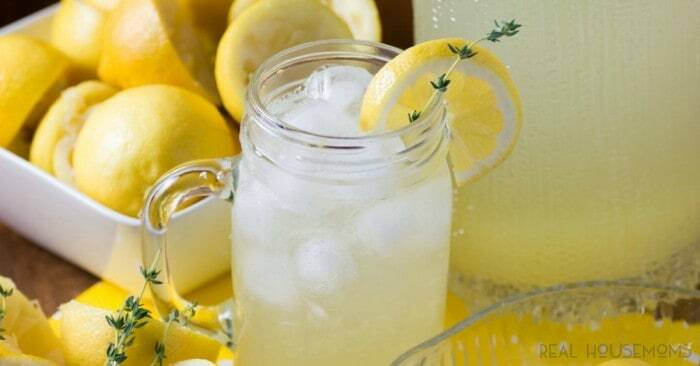 Lemonade is the quintessential porch sipper. Start to enjoy it earlier in the spring and love it all summer long too! 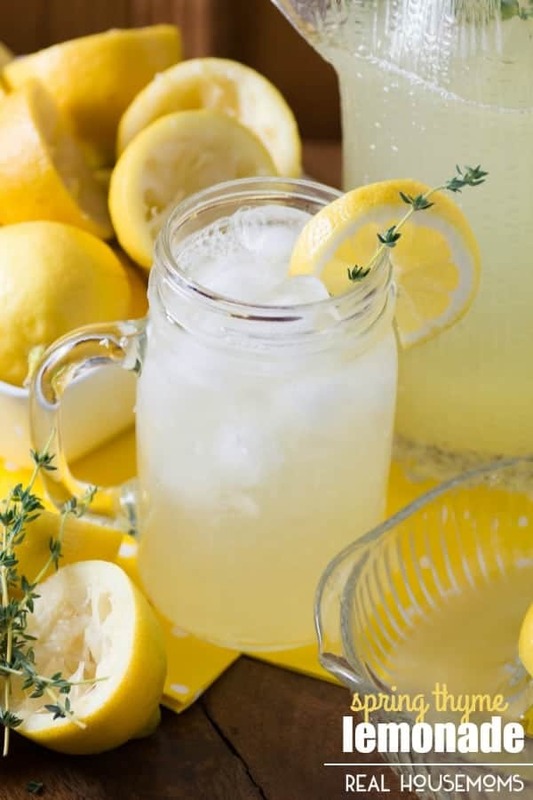 A gorgeous refreshing lemonade infused with thyme makes it a perfect beverage for spring!! Mix the 1 cup sugar and water together in a small saucepan over medium heat. Bring to a simmer and stir until sugar is dissolved. Add thyme and simmer gently for 1 min. Take off the heat and let steep for 10 min. Remove the thyme sprigs. This can be made ahead of time and refrigerated for a few days. When ready to serve, add the simple syrup to a large pitcher along with the freshly squeezed lemon juice and the 5 cups of water, stir well. Serve over ice, garnished with a sprig of thyme and a slice of lemon. 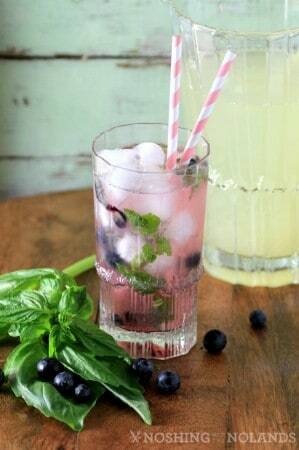 Come on over to Noshing With The Nolands to see the recipe for the Blueberry Basil Lemonade, another delicious lemonade I am sure you will love to try. What a fantastic idea! Thyme will add such a lovely depth of flavour to the lemonade and it looks so pretty too! Thanks for sharing. I love the simplicity of this drink. It’s healthy and refreshing. Can I also use other tea’s?